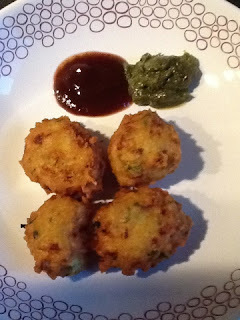 Left over pongal at home or wanna try something new,try this easy recipe for a change:-)Pongal vada!! Take a big mixing bowl and add pongal,besan ,rice flour,onion,chillies and salt. Mix well without adding any additional water as the water content in pongal will be quite sufficient. Heat a frying pan with oil and keep it ready. Now make small lemon sized balls with the batter and fry them in the pan until golden brown on low to medium heat. Remove from pan and pat dry the extra oil.